Florida has just emerged from one of the wettest Octobers of record, as the state starts to dry-out and pleasant Fall weather takes hold out there in the Atlantic, in the Bermuda Triangle, a cell of low pressure that appeared in early November has been gradually getting organized and stronger as it slowly makes its way toward mainland USA! Late on Monday 7 November this weather system was generating large amounts of rain north of its center over Bermuda and the National Hurricane Center was giving it a high probability (~70%) that it could develop into the next cyclone of the 2011 Atlantic Hurricane season, which has so far generated 17 named storms including six hurricanes. 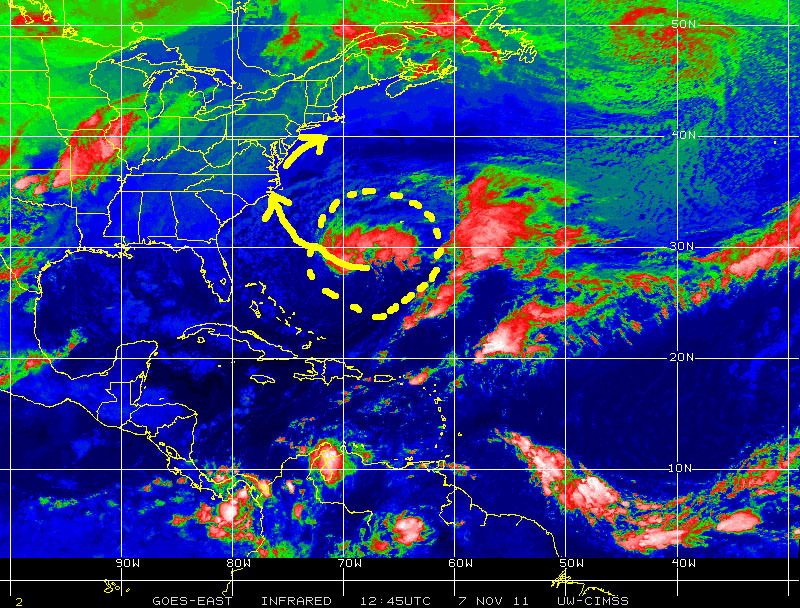 Could this be Sean, the 18th named storm of the 2011 Atlantic season? Speaking of storm names, as a matter of anecdotal interest, the 2011 list of names for storms is the same that was used in 2005 except for a record five names that were retired from the list because of their strength as major hurricanes and the amount of damage they caused. The retired storm names were Dennis, Katrina, Rita, Stan and Wilma. On the official 2011 list the replacement names are Don, Katia, Rina, Sean and Whitney. These results from the National Hurricane Center preparing six alphabetical lists of twenty names each, which are used in the same order and then repeated, this is why the 2005 list is now being used again in 2011 except for the retirement and replacement of “infamous” storms. So far this year we haven’t had any major and destructive hurricane so if this continues the 2011 list will repeat in 2017 with the same names we have seen this year. 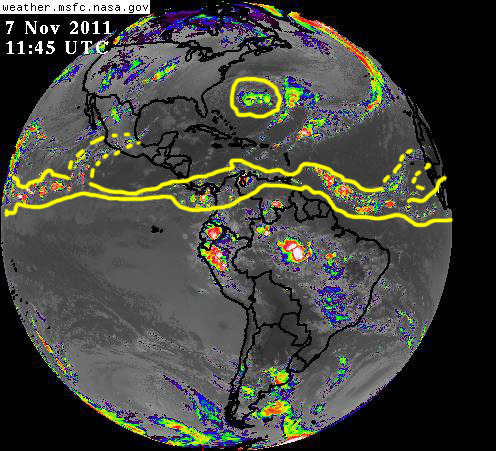 Other meteorological hazards that are active on this early days of November 2011 include an area of low pressure and stormy weather in the Arabian Sea., in an area that has seen similar events over the past few weeks. Another cell of disturbed weather with potential for cyclonic development lingers to the east and near the southern extreme of the Indian sub-continent. Shifting from the ocean-atmosphere environment, there has been quite a bit of ground shaking in Oklahoma over the past week. 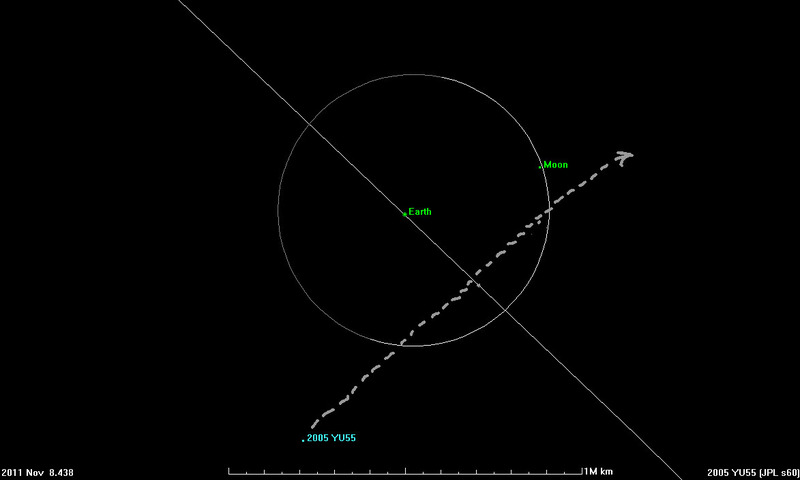 These seismic events have included a 4.7 magnitude quake on 4 November, and a magnitude 5.7 on 6 November 2011 with an epicenter just 8 km northwest of the town of Prague, and 72 km east of Oklahoma City, located at the rather shallow depth of 5 kilometers. The region of Oklahoma where both these quakes and numerous aftershocks have hit over the last 4 – 5 days has a history of light to moderate seismic activity with most quakes in the 2 -4 magnitude range, with a few 4.5 -6 magnitude earthquakes occasionally occurring. Early reports are of moderate damage, mainly in the form of toppled unreinforced masonry structures, and structural cracks on some buildings. 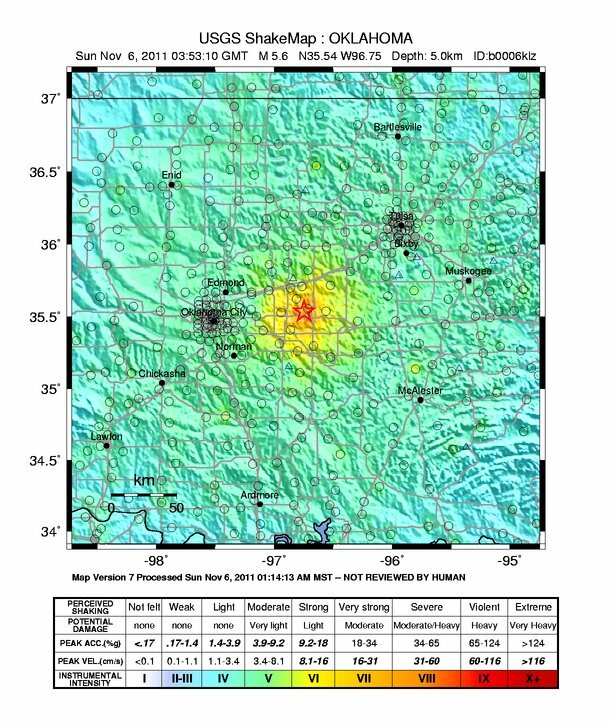 Despite its moderate impact and damage this Oklahoma event is significant because it has taken place near the center of the continental USA not too far from the New Madrid major seismic fault region, where a swarm of earthquakes hit over a three-month period in 1811-1812 that included a possible magnitude 8.0 earthquake. 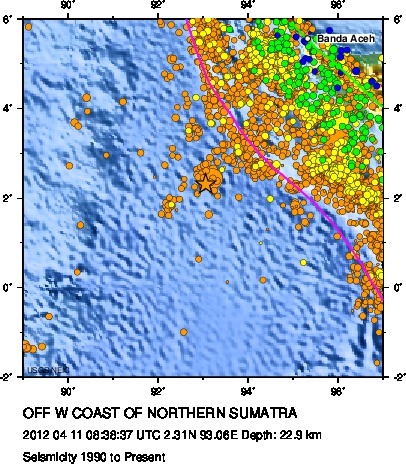 Other major earthquakes have hit this region, including one on Christmas Day 1699 that was written about by early explorers and settlers, and numerous prehistoric events that have left their signatures in the geological record. This whole region is considered a major seismic province capable of triggering major earthquakes in the future. The map that follows, courtesy of the USGS National Earthquake Information Center [NEIC] shows earthquakes that generated in Oklahoma from 1990 through 2006. Each of the orange circles represents an earthquake, with the size of the circle being proportional to the magnitude of the quake. 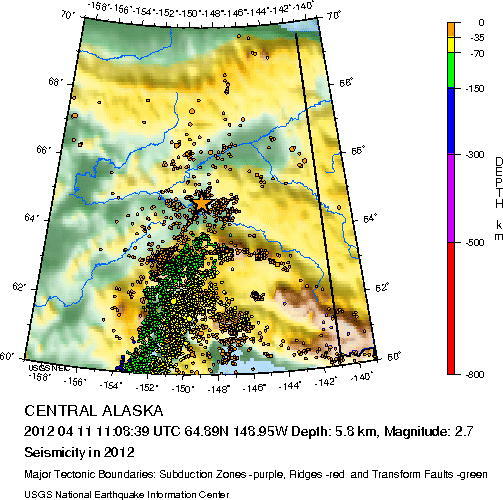 This record shows most of the recent seismic activity has taken place on in the central-southern portion of the state. This map also shows some prior activity in the region to the east of Oklahoma City where the latest seismic events took place. Map showing seismic activity from 1990 through 2006 in Oklahoma and neighboring northwestern Texas. These events are just an example of what is typical of the hazardous planet we inhabit, which serves to illustrate the point that humankind lives with risk on an everyday basis. This underscores the need for maintaining a continuous effort of research, public education and outreach, to better understand the natural processes at work on Earth and the natural hazards – sources of potential damage – that may threaten vulnerable communities worldwide, and the need to be prepared and practice hazard mitigation on a constant basis.